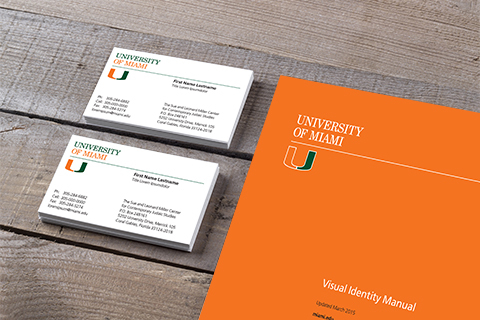 The University of Miami employs strategic, well-executed communications and cohesive visual identity standards to support its reputation of excellence. By its very nature, a university is a consolidated assembly; the strength and quality of each part reflect upon the whole as well as other individual units. A cohesive and consistently applied graphic identity is an important tool that helps to reinforce our message and presence, and thereby serves to advance the University. The University of Miami Visual Identity Manual provides specific guidelines and standards for the system in all forms of University communication. Adherence to these guidelines is vital for the University to be represented in a uniform and consistent fashion. To maximize the benefits of a visual identity system, it is the University's policy that the signatures, logos, type fonts, and marks as described in the manual are the only authorized marks to be used in all University communications. Within the framework of the system there is flexibility to accommodate the needs of units throughout the University. University Communications is responsible for the system and for ensuring that the visual identity of the University of Miami is preserved and enhanced through effective, well-designed communications. It manages and monitors the use of the system and makes system graphics available to the University community and other authorized parties. If you have questions concerning the system or need to obtain graphic signatures for a University of Miami school, college, or adminstrative area, send your e-mail query to umcommunications@miami.edu. Editorial standards for internal and external communications are available at University of Miami Editorial Guidelines.